This is where I live and what I love. No crowded theme parks for me. I prefer the "Real Florida". The hidden out of the way places that we don't always pay attention to. ​These are the scenes I choose to preserve on canvas forever. 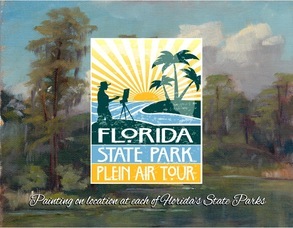 The Florida State Park Tour Project - I spent a year creating a painting at each of Florida's 140 State Parks. See and purchase the Paintings by clicking here, and read about the painting adventure on my blog. A collection of paintings created on location (en plein air) at some of Florida's iconic disappearing natural landscapes. ​is unique and beautiful in its own way. This new series attempts to capture the uncapturable. Canvas and Paper Prints of my most popular paintings are now available!